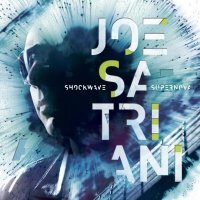 It's hard to believe that this is Joe Satriani's fifteenth studio album, a pretty mean feat when you consider how different some of them have been to each other, and the fact that a vast majority of them have been all instrumental. Not only is he working with co-producer John Cuniberti on this one, he's also kept the members of his last touring band; bassist Bryan Beller, ace drummer Marco Minneman and keyboard/guitar virtuoso Mike Keneally along with the legendary Vinnie Colaiuta behind the kit for four numbers. Like some of Satriani's best work, there's a lot of variety on 'Shockwave Supernova'; a myriad of different styles harking back to his 'Surfing With The Alien', 'Flying In A Blue Dream' and 'The Extremist' era. The most noticeable thing is the drumming, as none of the tunes Rock out to a standard beat, Minneman and Colaiuta inserting more feel and groove into Shuffle, Funk and Jazz rhythms. Satriani himself uses lots of different sounds so that no two tunes sound the same. For instance, for all its trademark melodies and solos, 'Lost In A Memory' chugs along as a slow shuffle when a standard 4/4 would have given it a completely different feel. The gritty distortion of 'Shockwave Supernova' and the upbeat 'On Peregrine Wings' still Rock pretty well, and 'Cataclysmic' and 'A Phase I'm Going Through' fairly thud along on heavy bass riffs, whilst the cool 'In My Pocket' and light Boogie tune 'San Francisco Blue' are certainly more about the tune and atmosphere than any showing off. Among the highlights are the quirky 'Crazy Joey' with its lazy groove and ridiculously fast arpeggios (think 'The Mystical Potato Head Groove Thing' on acid! ), Keneally's great piano and Satriani's solos on the fabulous 'Keep On Movin'' and the tuneful melodies of 'All Of My Life'. At the other end of the spectrum, the beautiful interlude 'Butterfly And Zebra', the mellow 'Stars Race Across The Sky' and the atmospheric 'Goodbye Supernova' are amongst the best low-key tunes he's ever written. It's unusual for an album with fifteen tracks to have no real dips in quality, some of the tunes are immediate, others require several plays to reveal the layers of arrangements and take in what the other musicians are doing beneath Joe Satriani's impeccable playing. He and Cuniberti have also done an exemplary job on the production and mixing, with everything clearly audible and the album having a great sound on speakers, headphones and even iPod.